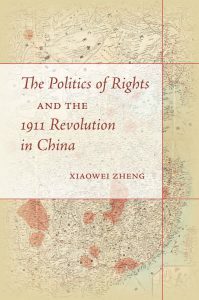 Professor Zheng has just published her monograph The Politics of Rights and the 1911 Revolution in China with Stanford University Press. China’s 1911 Revolution was a momentous political transformation. Its leaders, however, were not rebellious troublemakers on the periphery of imperial order. On the contrary, they were a powerful political and economic elite deeply entrenched in local society and well-respected both for their imperially sanctioned cultural credentials and for their mastery of new ideas. The revolution they spearheaded produced a new, democratic political culture that enshrined national sovereignty, constitutionalism, and the rights of the people as indisputable principles. Based upon previously untapped Qing and Republican sources, The Politics of Rights is a nuanced and colorful chronicle of the revolution as it occurred in local and regional areas. Zheng explores the ideas that motivated the revolution, the popularization of those ideas, and their animating impact on the Chinese people at large. The focus of the book is on the transformative effect that revolution has on people and what they learn from it. For more information, please see her blog post China’s Political Paradox.